From a book fair for foodies to a crash course in iPhone photography, March is chock-full of good stuff to do. No need to fly to D.C. to see lovely Japanese flowers. 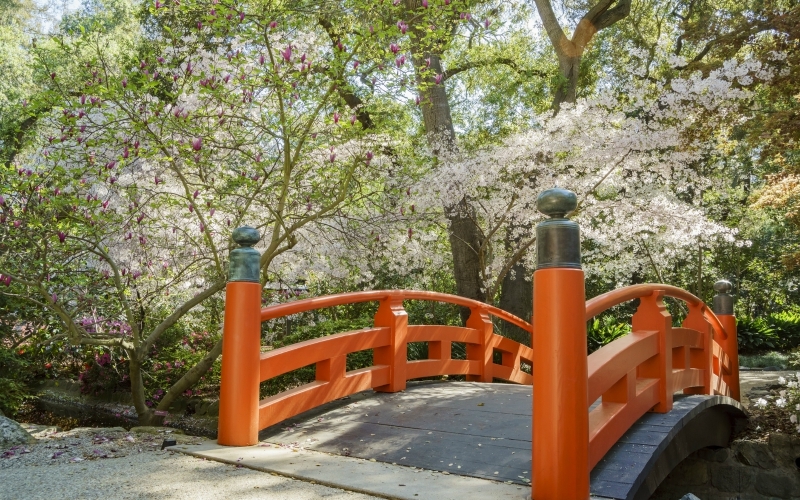 Descanso Gardens celebrates its princess-pink cherry blossoms—not to mention its lilacs and tulips—with a month of guided weekend walks, origami demonstrations, and woodblock print workshops. We’d be skeptical of something pitched as “the Coachella of writing about eating” if the event didn’t sound so awesome. New York’s Food Book Fair teams up with Smorgasburg LA and the Ace Hotel to bring us talks on is- sues like immigrant cuisine, “foodieodicals” (food + periodicals) from magazine makers the world over, and more. Venues vary, so check the skedge early and often. Shaun White brings snow to Expo Park, where pro athletes turn out to shred during this annual snowboarding/art/music festival (this year’s headliners: Zedd and Phoenix with Gucci Mane). White ups the ante for 2018 with a street-style skateboarding competition inspired by L.A.’s venerated skate history. Serena Williams and Roger Federer are just two heavy hitters who’ve been served at this tournament. You’ve got two weeks to grab a seat at Oracle founder Larry Ellison’s Indian Wells Tennis Garden, where players vie for more than $10 million in prize money. While you’re there, eat like royalty at outposts of Nobu and Spago. The Joffrey Ballet puts a twist on the Bard’s romantic tragedy at the Dorothy Chandler Pavilion. In this version, the star-crossed lovers fall hard for each other in Mussolini-era Italy, where their love blossoms amid political storms. Pork is the only white meat at this bonkers exultation of heritage pig at Santa Monica’s Viceroy hotel, where five chefs compete in a nose-to-tail charity cook-off. Indulge in meat dishes, a cheese bar, and lots of booze to wash it down. If all pork everything isn’t your speed, hold out for NoHo’s Vegan Street Fair on March 25. Los Angeles is Saatchi Art’s home base,but this is the inaugural West Coast edition of its fair focused on emerging artists. More than 100 up-and-comers from California and around the globe showcase their work—selected by a panel including YACHT’s Claire Evans—at DTLA’s Majestic Downtown. PaleyFest is like ComicCon for TV nerds, and it’s the festival we deserve in this golden age of the small screen. Head to the Dolby Theatre for panels with stars of The Handmaid’s Tale, Stranger Things, Silicon Valley, and more. Skip the St. Patrick’s Day bar crawl and opt instead for this “food fantasy experience,” as it’s being billed, that borrows its name from a beloved Parks and Recreation episode. Vendors including Caked LA (whose drinks come topped with a slice), Sky’s Gourmet Tacos, and longtime favorites like Sprinkles and the Pie Hole are on hand at the Barker Hangar, slinging eats. There’s more to a great ’gram than deciding between the Clarendon and Gingham filters. Photographer and social media consultant Bonnie Tsang teaches lighting, composition, and editing as she leads you through the Line hotel, where you’ll snap pics of its interiors, pool, and the restaurant Commissary. A New York-based organization that orchestrates pop-up Bach concerts in subways (duh) and elsewhere marks the composer’s 333rd birthday with five days of performances all over L.A. Don’t miss the ten-hour marathon at Union Station on March 24. If anyone’s had enough of this “women aren’t funny” business, it’s Nell Scovell. The former writer for Late Night with David Letterman (and cowriter of Sheryl Sandberg’s Lean In) sits down with Conan O’Brien and Greg Daniels—her former Wilton North Report colleagues— at the Skirball to discuss her new memoir, Just the Funny Parts.